Download "MobileIron for ios. Our Mobile IT Platform: Purpose-Built for Next Gen Mobility. 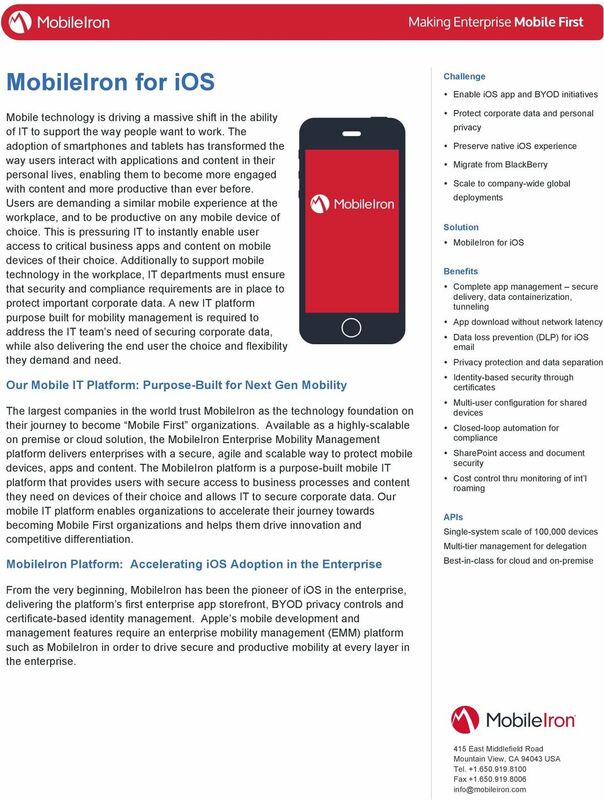 MobileIron Platform: Accelerating ios Adoption in the Enterprise"
3 Mobile Device Management The ios experience has always focused on delivering user delight with intuitive workflows on device. While ease-of-use is important to the enterprise, security is also a critical concern. 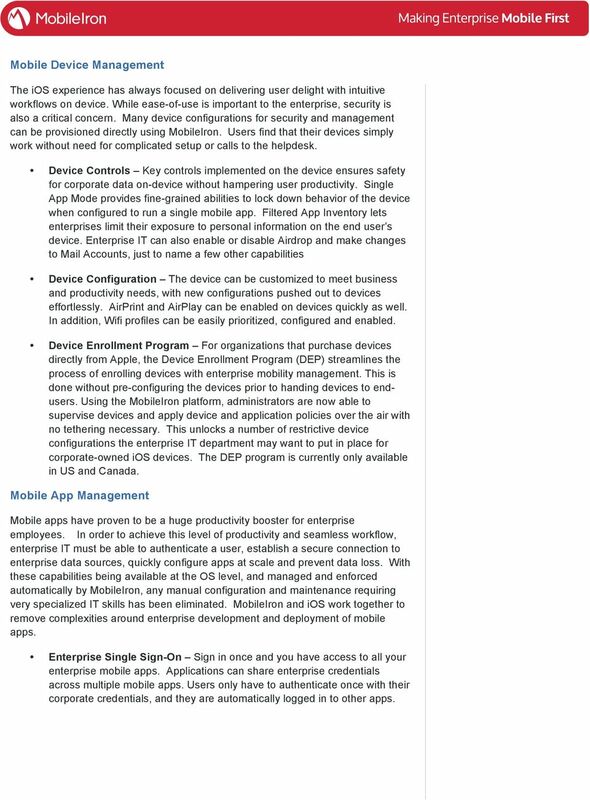 Many device configurations for security and management can be provisioned directly using MobileIron. Users find that their devices simply work without need for complicated setup or calls to the helpdesk. Device Controls Key controls implemented on the device ensures safety for corporate data on-device without hampering user productivity. Single App Mode provides fine-grained abilities to lock down behavior of the device when configured to run a single mobile app. Filtered App Inventory lets enterprises limit their exposure to personal information on the end user s device. Enterprise IT can also enable or disable Airdrop and make changes to Mail Accounts, just to name a few other capabilities Device Configuration The device can be customized to meet business and productivity needs, with new configurations pushed out to devices effortlessly. AirPrint and AirPlay can be enabled on devices quickly as well. In addition, Wifi profiles can be easily prioritized, configured and enabled. Device Enrollment Program For organizations that purchase devices directly from Apple, the Device Enrollment Program (DEP) streamlines the process of enrolling devices with enterprise mobility management. This is done without pre-configuring the devices prior to handing devices to endusers. Using the MobileIron platform, administrators are now able to supervise devices and apply device and application policies over the air with no tethering necessary. This unlocks a number of restrictive device configurations the enterprise IT department may want to put in place for corporate-owned ios devices. The DEP program is currently only available in US and Canada. Mobile App Management Mobile apps have proven to be a huge productivity booster for enterprise employees. In order to achieve this level of productivity and seamless workflow, enterprise IT must be able to authenticate a user, establish a secure connection to enterprise data sources, quickly configure apps at scale and prevent data loss. With these capabilities being available at the OS level, and managed and enforced automatically by MobileIron, any manual configuration and maintenance requiring very specialized IT skills has been eliminated. 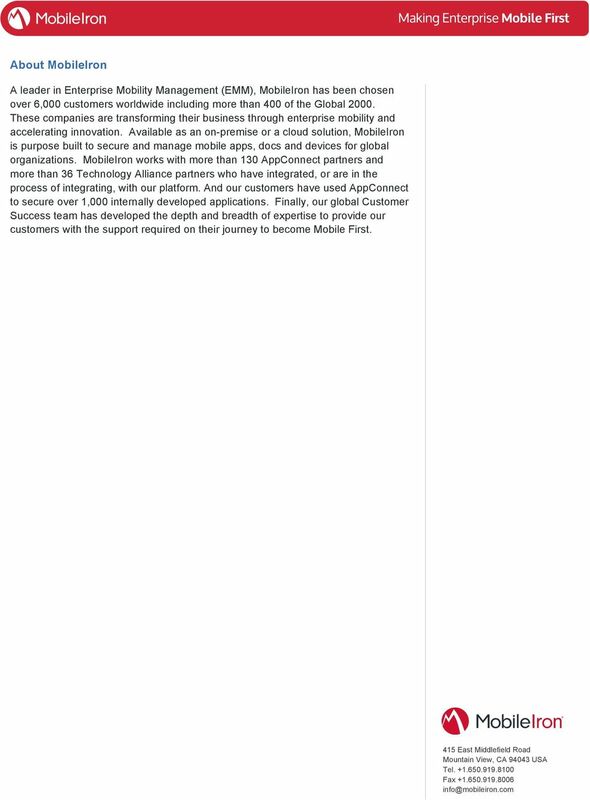 MobileIron and ios work together to remove complexities around enterprise development and deployment of mobile apps. Enterprise Single Sign-On Sign in once and you have access to all your enterprise mobile apps. Applications can share enterprise credentials across multiple mobile apps. Users only have to authenticate once with their corporate credentials, and they are automatically logged in to other apps. 4 Managed Application Configuration Deploy configured enterprise mobile apps at scale. Large deployments of mobile apps often require custom configurations specific to different geographic regions, corporate divisions, and/or security requirements. With MobileIron s support for the ios platform, the mobile IT administrator can effortlessly deliver the right app, with the right configuration, to the right user and the right device. The configuration is completely transparent to the end user and little to no further action needs to be taken. 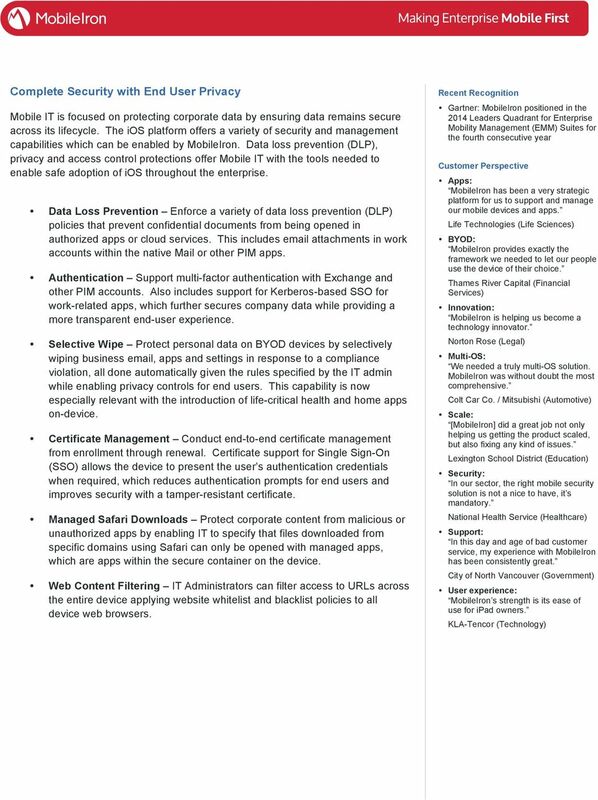 Open In Management Administrators can specify which mobile apps may share certain content, enabling end users to get mobile access to the information they need, while also securing that enterprise content. Per app VPN and VPN on-demand VPN security is immediate and invisible to the end user while being specific to the mobile app. 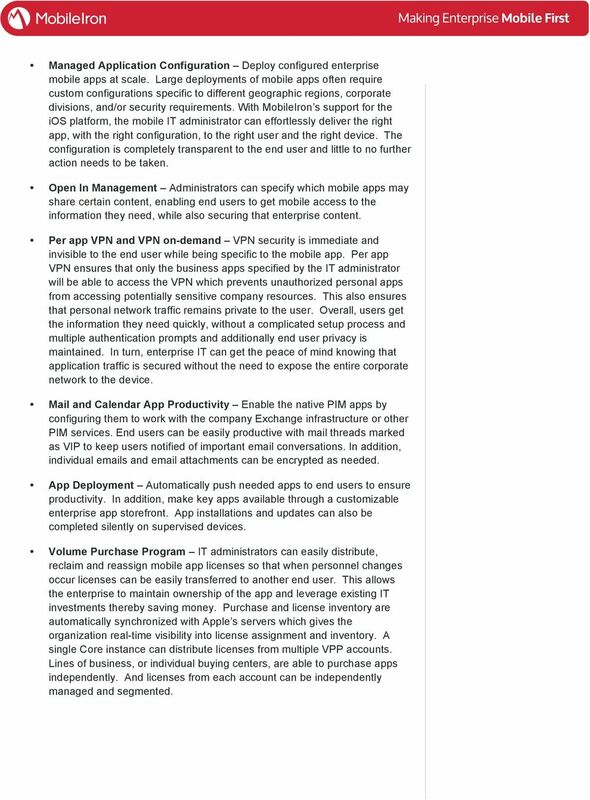 Per app VPN ensures that only the business apps specified by the IT administrator will be able to access the VPN which prevents unauthorized personal apps from accessing potentially sensitive company resources. This also ensures that personal network traffic remains private to the user. Overall, users get the information they need quickly, without a complicated setup process and multiple authentication prompts and additionally end user privacy is maintained. In turn, enterprise IT can get the peace of mind knowing that application traffic is secured without the need to expose the entire corporate network to the device. Mail and Calendar App Productivity Enable the native PIM apps by configuring them to work with the company Exchange infrastructure or other PIM services. End users can be easily productive with mail threads marked as VIP to keep users notified of important conversations. In addition, individual s and attachments can be encrypted as needed. App Deployment Automatically push needed apps to end users to ensure productivity. In addition, make key apps available through a customizable enterprise app storefront. App installations and updates can also be completed silently on supervised devices. Volume Purchase Program IT administrators can easily distribute, reclaim and reassign mobile app licenses so that when personnel changes occur licenses can be easily transferred to another end user. This allows the enterprise to maintain ownership of the app and leverage existing IT investments thereby saving money. Purchase and license inventory are automatically synchronized with Apple s servers which gives the organization real-time visibility into license assignment and inventory. A single Core instance can distribute licenses from multiple VPP accounts. Lines of business, or individual buying centers, are able to purchase apps independently. And licenses from each account can be independently managed and segmented.